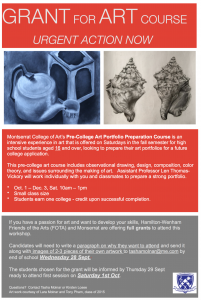 Montserrat College of Art’s Pre-College Art Portfolio Preparation Course is an intensive experience in art that is offered on Saturdays in the fall semester for high school students aged 16 and over, looking to prepare their art portfolios for a future college application. This pre-college art course includes observational drawing, design, composition, color theory, and issues surrounding the making of art. Assistant Professor Len Thomas-Vickory will work individually with you and classmates to prepare a strong portfolio. Students earn one college - credit upon successful completion. If you have a passion for art and want to develop your skills, Hamilton-Wenham Friends of the Arts (FOTA) and Monserrat are offering full grants to attend this workshop. Candidates will need to write a paragraph on why they want to attendand send it along with images of 2-3 pieces of their own artwork to tashamolnar@me.com by end of school Wednesday 28 Sept. The students chosen for the grant will be informed by Thursday 29 Sept ready to attend first session on Saturday 1st Oct.